A sunny evening, a tranquil garden – and an old man brutally gunned down on his doorstep. In the pretty and peaceful market town of Kirkluce a proposed superstore development has divided the population in an increasingly bitter war. The low-level aggression of bored youth that is generally tolerated has become sinister. The bloodied corpse of a sheep abandoned in the streets is more than just unpleasant vandalism and teenage bikers, terrorising a woman to breaking point, are impossible to control. When a second victim is killed in what seems a random shooting, the fear in the town becomes tangible. DI Fleming will not accept that the crimes are motiveless, but she struggles to make sense of the two murders, when nothing makes sense any more and no on will believe anything. Not even the truth. A fascinating, humane and credible series… reading about them is a real pleasure. The allegiances, rivalries and petty jealousies of small town life are carefully but convincingly explored….a dramatic climax. 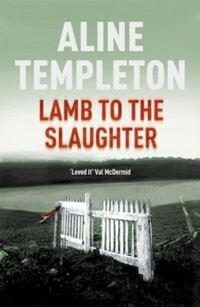 Reading Templeton has become something of an addition. Rich in characterisation and evocative detail, if you’ve yet to discover the outstanding Marjory Fleming series, here’s a great place to start. This easy-paced whodnit…is a breath of fresh air… Templeton’s uncomplicated writing style helps to achieve what many others fail to – it makes an intricate plot easy to follow. This entry was posted in Books, The Marjory Fleming Series by Aline Templeton. Bookmark the permalink.